A battalion of foot soldiers while away their working hours hundreds of metres up the UAE skyline. MEE goes vertical to meet the high flyers. These cheery words, as spoken to me some days earlier by the boss of one of Dubai’s top billboard companies, rather unhelpfully decide to plant themselves on repeat in my head as I’m winched up the face of a 50-storey building, suspended by little more than a few dubious-looking ropes. As I put on the hardhat (which will also “disintegrate on impact”, according to my source) and flimsy high-visibility jacket, press buttons and nod absent-mindedly during my safety training, what’s to come seems like the perfect adventure – till the ground begins to fall away beneath my trembling knees and the Indiana Jones theme song taps out. “Well,” I think to myself with a certain resignation, as we jolt ever-higher in our absurdly lightweight building cradle attached through a series of pulleys and clamps, “this jacket may not break my fall, but at least people will see me coming.” Small comfort. But of course by dint of my putting pen to paper it’s clear I am perfectly fine and not reaching you from beyond the grave. In fact, I imagine a sort of stoic calm set in approximately halfway up our 150-metre vertical journey; the same sort of attitude that escorts thousands of workers in the UAE up and down skyscrapers, day after day. 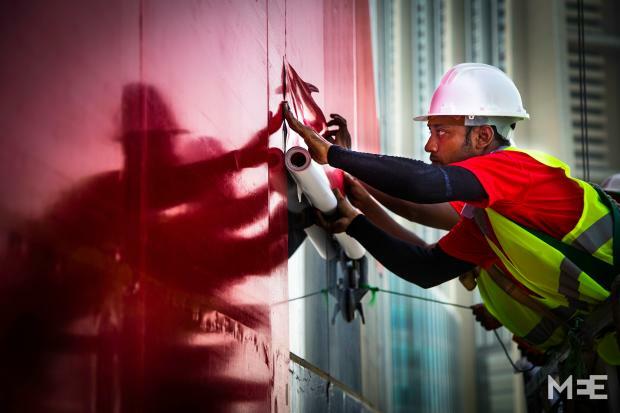 From window-cleaners to scaffolders to builders to signage skywalkers, Dubai is home to an invaluable, unflappable legion of high-rise heroes. One wrong foot could prove deadly, yet they go about their jobs with quiet aplomb. 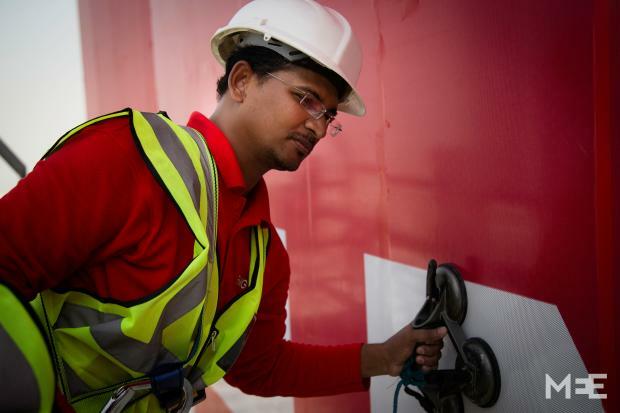 Mohammed Abu Bakar, 35, is a senior applicator at Emirates Neon Group (ENG) and a brave man. He takes my life in his hands, but more importantly that of his boss ENG CEO Rehan Merchant, operating the cradle that takes us up the Warwick Hotel building in downtown Dubai. He has spent an average of about 150 days each of the past eight years traversing the acreage of real estate in the home of the world’s tallest building, the Burj Khalifa, and her shorter siblings. Merchant presides over the business his father started in 1970, becoming CEO in 1997. While the company provides traditional advertising through radio, newspaper and digital media, outdoor advertising comprises between 50 and 60 per cent of their work. 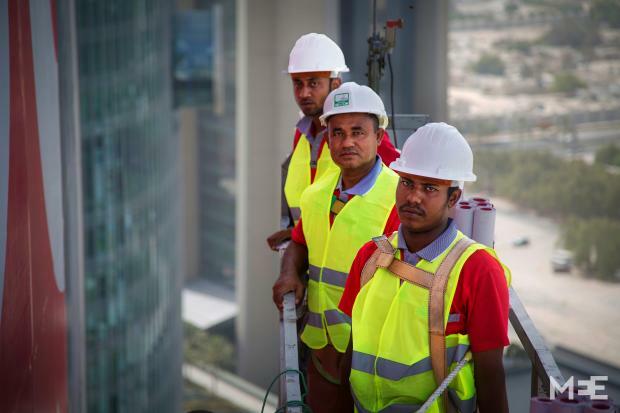 Of their 1,200 workers, ENG has an army of about 50 men who, like Bakar, are more or less dedicated to high-rise work. In Bakar’s case, the Pakistani native spent his first five years in Dubai placing adverts on vehicles like taxis and low-rise buildings, before undergoing training. 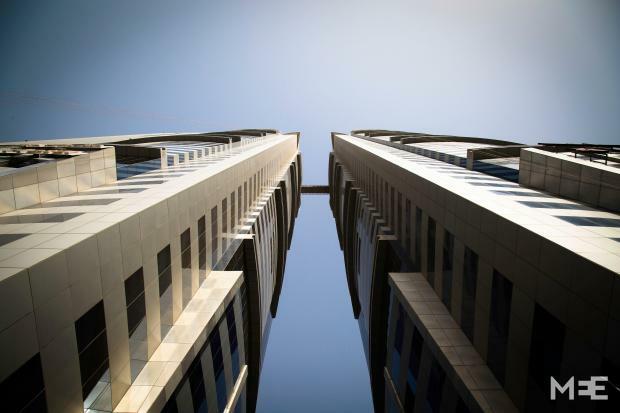 Bakar’s wife and three daughters are still in his hometown Karachi, where the tallest buildings touch 20 storeys – a good 35 floors lower than the highest building he has worked on in Dubai. Not that Bakar seems particularly concerned. He says he’s never felt scared even in the high winds that lock the cradle in place making it impossible to descend. The 35-year-old hopes to become a supervisor in the future, but wouldn’t swap his al fresco office for indoor work. On the adjacent, western facade of the same hotel where the ENG staff are putting up their giant billboard, window cleaners are clutching onto the side of the building like hygiene-focused Spidermen. Down below on terra firma, I speak with two young Nepalese cleaners who were recruited from their home in the mountainous district of Kavre just over one year ago. Bahadur Singh and Kumar Tamang, both 20, were lured to Dubai with the promise of riches to help support their families, Singh leaving behind a hospitality job and Tamang quitting his hotel management degree. The men earn $435 a month or $5220 annually, which may not sound like a lot but far outstrips Nepal’s 2013 gross national income per capita of $730, which placed it 193rd globally just ahead of Afghanistan. 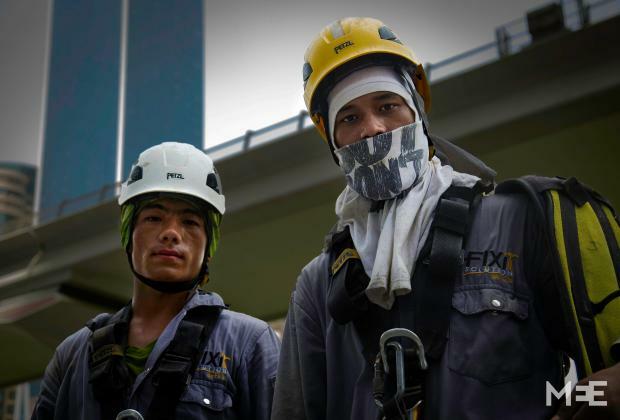 Tamang says after one week’s training the young men were scaling 90-floor buildings – reaching 355 metres. Coming from the land of the Himalayas, they are at least used to the altitude. This is surprising nonchalance in the face of proven danger. 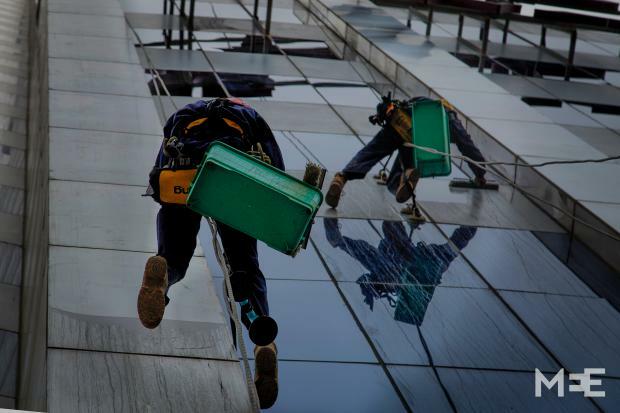 Every few months the country’s headlines report the death of another window cleaner from failed equipment, the most recent in April this year. Official numbers are hard to come by (last year the Abu Dhabi government said workplace falls had dropped by a third without detailing figures) but Eyad Issa, the operations manager at safety and security consultancy B Safe, says he hears of high rise accidents every two to three months – about 70 percent of which are fatal. Tamang has not explained the true nature of his work to his family to save them the worry, but it would be difficult to explain even if he tried. The highest buildings they have at home barely reach 15 floors. The men are divided about where their future lies, with Singh seeing Dubai as a short-term prospect and Tamang in for the long haul. Merchant explains that most of the recruits for the high-rise work are from Nepal, India, Pakistan and Bangladesh. Obviously, there’s another important consideration in recruiting these workers. 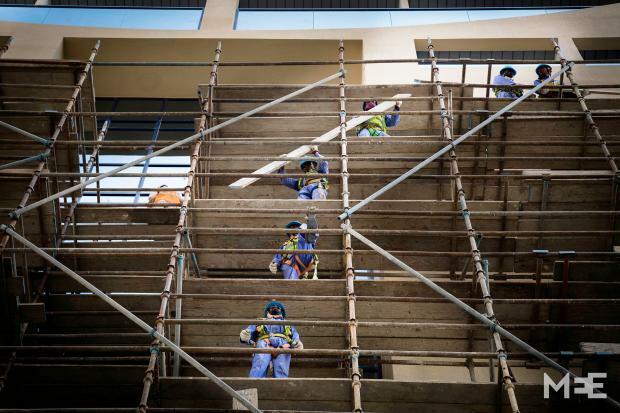 The exclusively male recruits, who are generally between 20 and 50, undergo a month of training before they hit the ropes to install the signs that can stretch 5000 square metres across and take up to three weeks to install, wind dependent. Merchant says safety is of primary importance, not least of all to avoid potential problems from authorities and insurance companies. 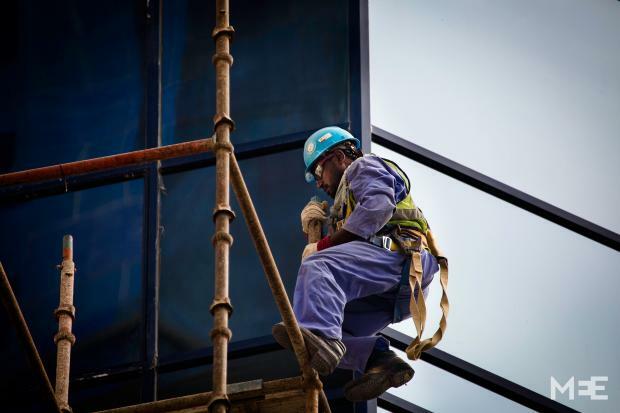 For the past few years summer has intersected with Ramadan and this is a particularly important time to ensure safety, with the workers getting the 2.5-hour midday break common to all workers in the UAE. But then, of course, there are the commercial considerations that weather conditions just don’t want to heed. 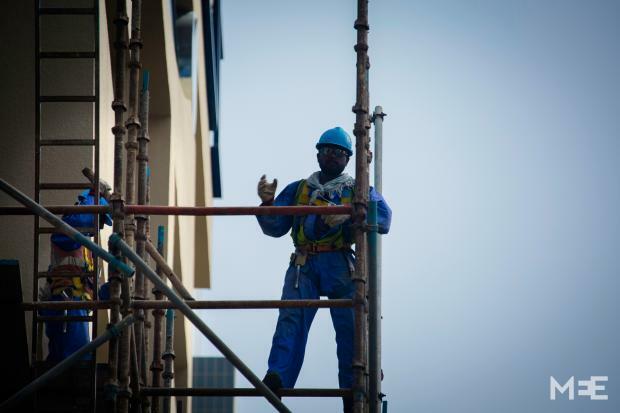 “We’ve tried to inculcate safety first but [the workers] know they need to finish [the job] as soon as possible because we have a certain target and timeline we need to meet for our clients. So it’s trying to put both in place,” Merchant says. ENG has a good safety record, and the young boss says, perhaps to reassure me, going up the building is a pretty safe bet. The company has an independent third-party operator come in and certify every cradle is set up properly before use, and the process repeats any time a cradle needs to be moved. But of course, as the troubling number of accidents is testament to, there are those who don’t do things by the book. B Safe’s Issa agrees. His company has a range of different industrial training courses, but one of the most important is a course called ‘Working at Heights’. It is a mandatory requirement in Dubai that all workers have this training, but it doesn’t happen in all cases, he says. Issa says accidents usually happen when worn-out wires snap and there’s a subsequent failure of the safety lock. Wires should be replaced every two years, but often aren’t. Brake pad failures in the motorised cradle units are another common problem. Most people cut corners to save money, but others simply don’t put a premium on safety. But the country is making great strides in its safety record, the Syrian says. If only these people would watch what happens to a coconut.